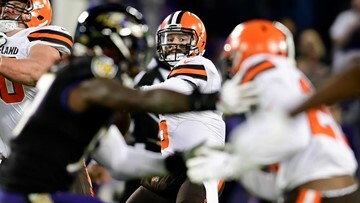 Cleveland Browns quarterback Baker Mayfield (6) looks to pass against the Cincinnati Bengals in the first half at Paul Brown Stadium in Cincinnati, Ohio. 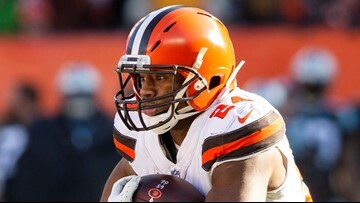 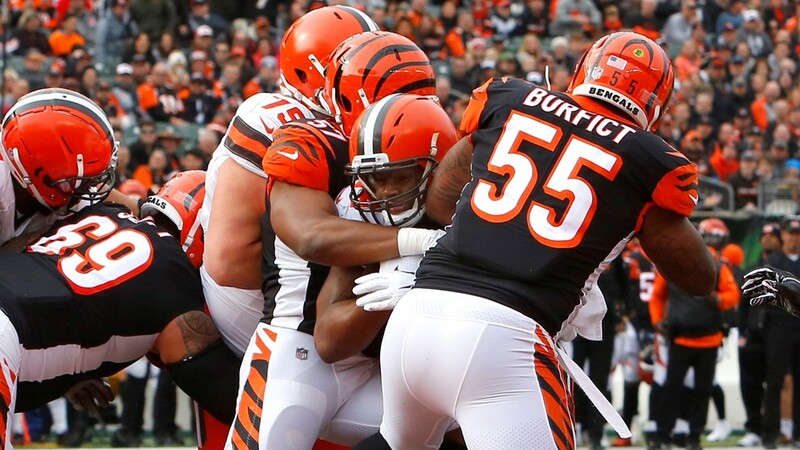 Cleveland Browns running back Nick Chubb (middle) breaks through for a touchdown against Cincinnati Bengals outside linebackers Vincent Rey (57) and Vontaze Burfict (55) during the first half at Paul Brown Stadium in Cincinnati, Ohio. 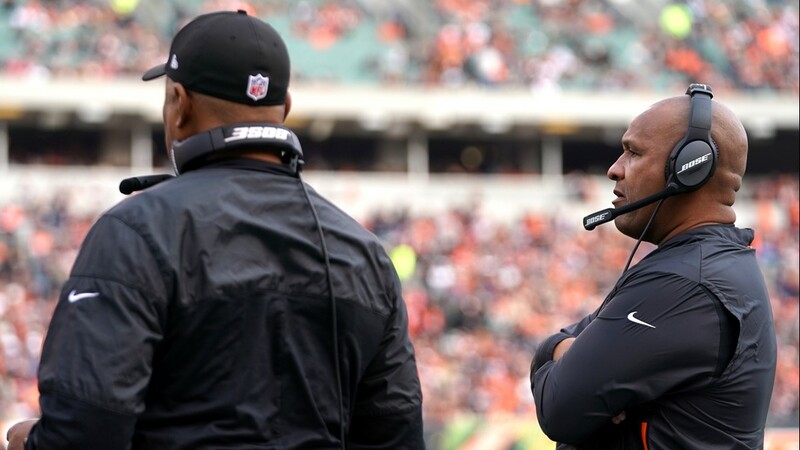 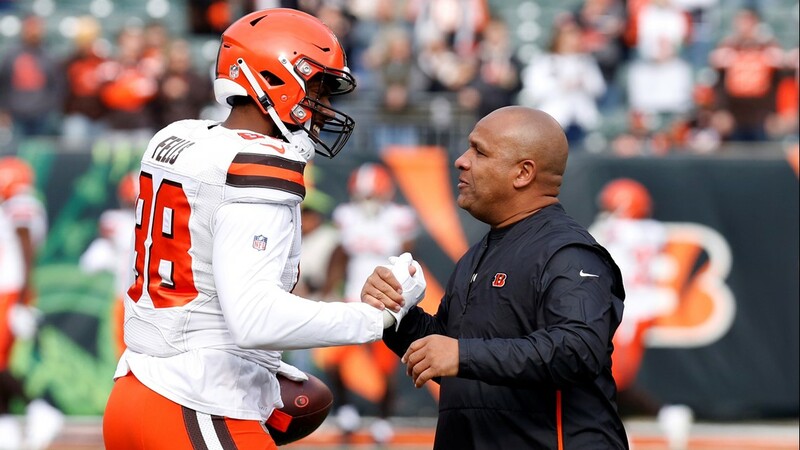 Cincinnati Bengals special assistant to the head coach Hue Jackson (right) stands alongside Marvin Lewis (left) in the game against the Cleveland Browns in the first half at Paul Brown Stadium in Cincinnati, Ohio. 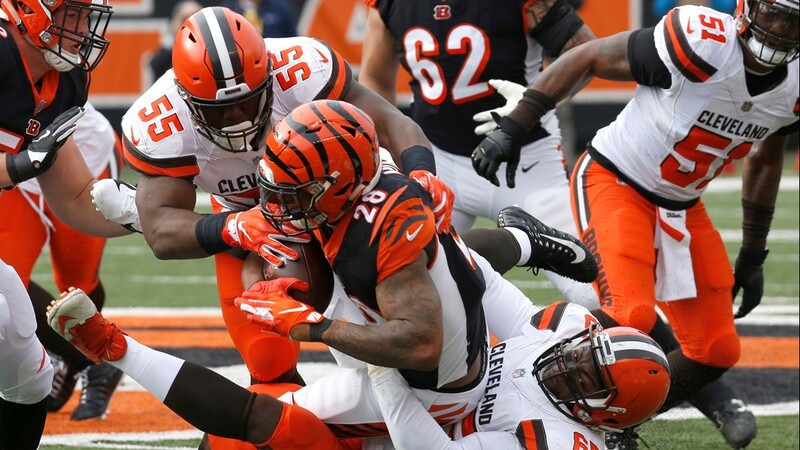 Cincinnati Bengals running back Joe Mixon (28) is tackled by Cleveland Browns defensive tackle Larry Ogunjobi (65) and outside linebacker Genard Avery (55) during the first half at Paul Brown Stadium in Cincinnati, Ohio. 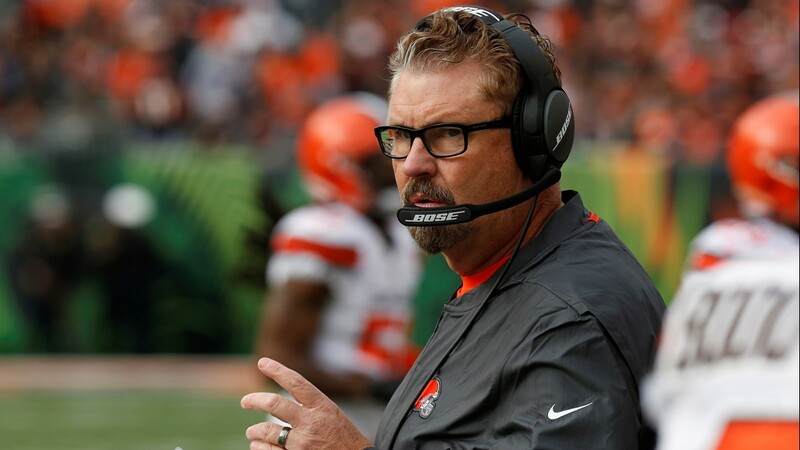 Cleveland Browns head coach Gregg Williams watches the action against the Cincinnati Bengals during the first half at Paul Brown Stadium in Cincinnati, Ohio. 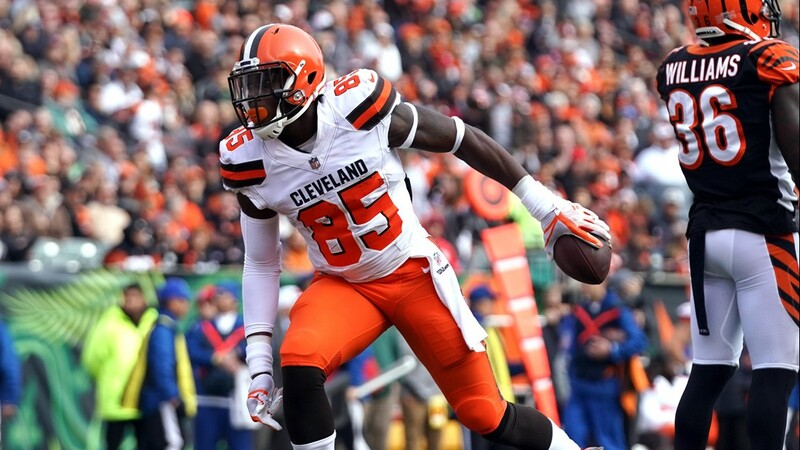 Cleveland Browns tight end David Njoku (85) reacts to making a catch against the Cincinnati Bengals in the first half at Paul Brown Stadium in Cincinnati, Ohio. 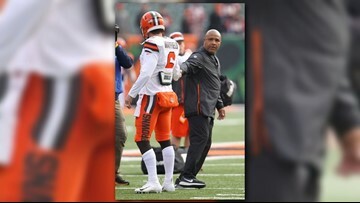 Cincinnati Bengals special assistant to the head coach Hue Jackson meets with Cleveland Browns tight end Darren Fells (88) at Paul Brown Stadium in Cincinnati, Ohio. 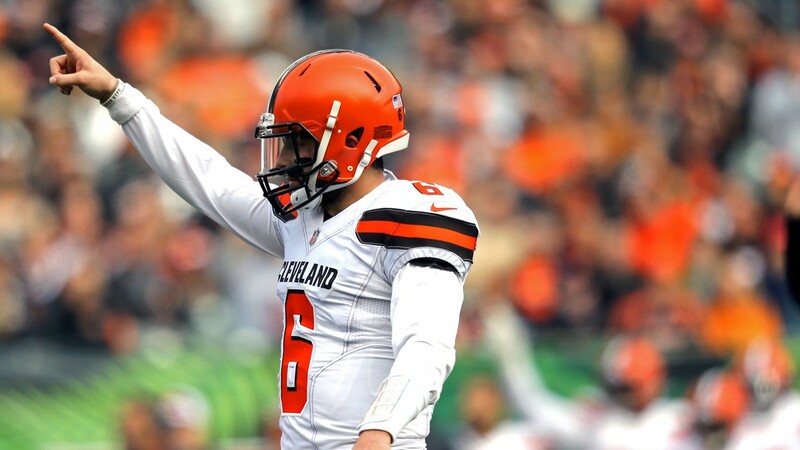 Cleveland Browns quarterback Baker Mayfield (6) reacts to a touchdown against the Cincinnati Bengals in the first half at Paul Brown Stadium in Cincinnati, Ohio. 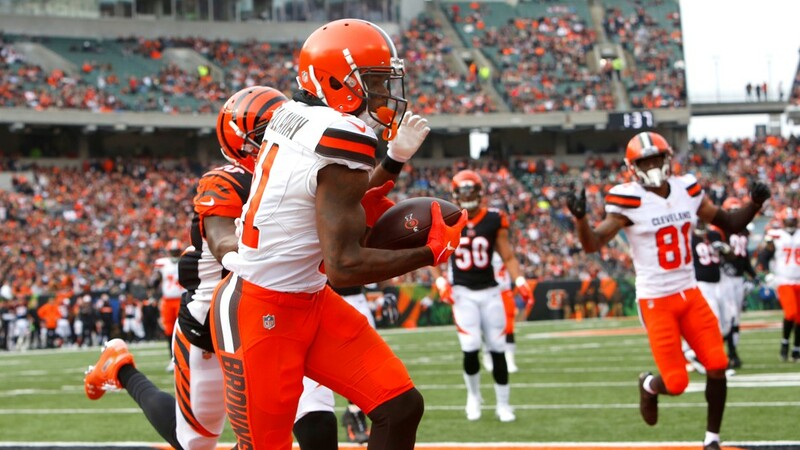 Cleveland Browns wide receiver Antonio Callaway (11) catches a touchdown pass against the Cincinnati Bengals during the first half at Paul Brown Stadium in Cincinnati, Ohio. 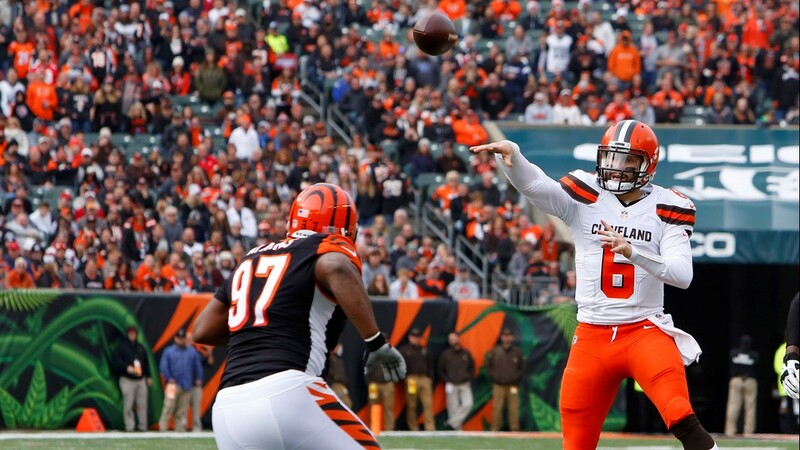 Cleveland Browns quarterback Baker Mayfield (6) throws a touchdown pass against Cincinnati Bengals defensive tackle Geno Atkins (97) during the first half at Paul Brown Stadium in Cincinnati, Ohio. 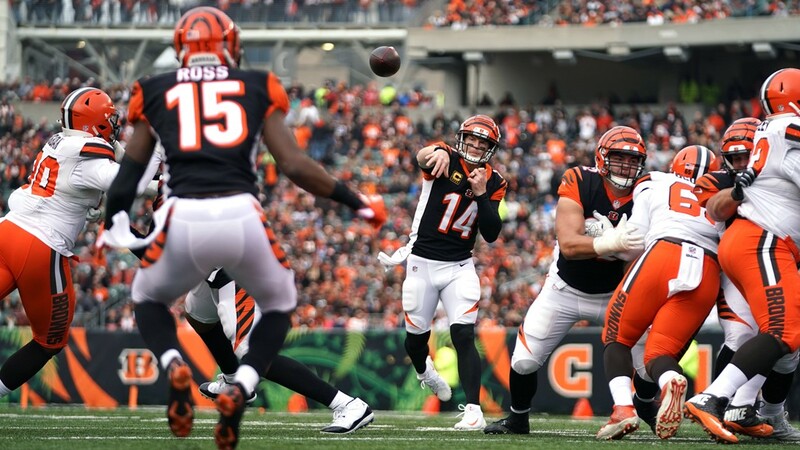 Cincinnati Bengals quarterback Andy Dalton (14) throws a pass for a touchdown to wide receiver John Ross (15) against the Cleveland Browns in the first half at Paul Brown Stadium in Cincinnati, Ohio. 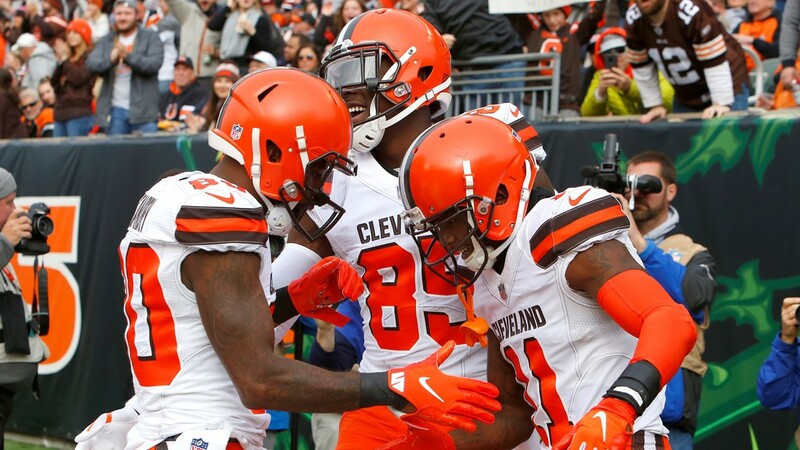 Cleveland Browns wide receiver Antonio Callaway (11) reacts with fellow receiver Jarvis Landry (80) and tight end David Njoku (85) after scoring a touchdown against the Cincinnati Bengals during the first half at Paul Brown Stadium in Cincinnati. 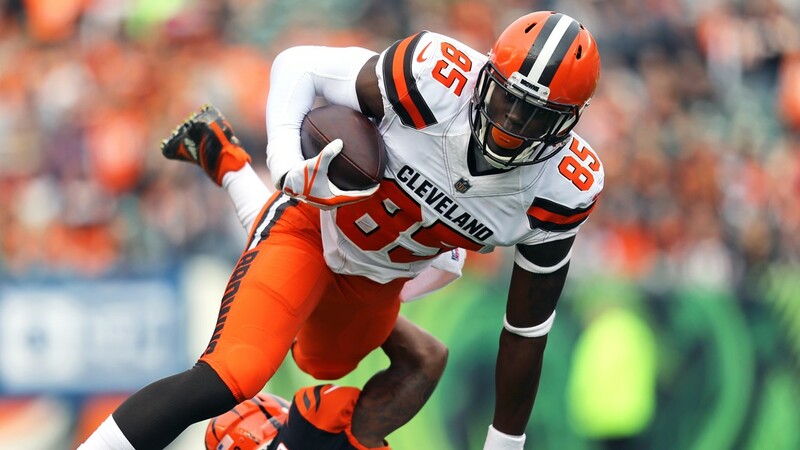 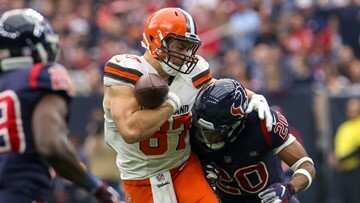 Cleveland Browns tight end David Njoku (85) is hit by Cincinnati Bengals defensive back Darqueze Dennard (21) in the first half at Paul Brown Stadium in Cincinnati, Ohio. 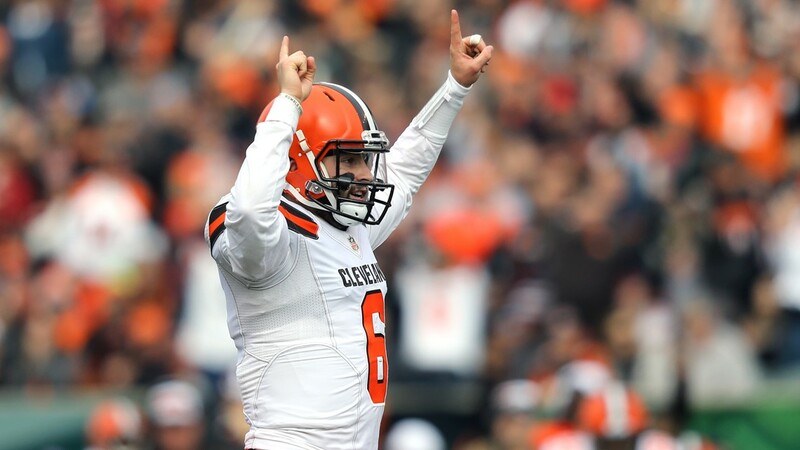 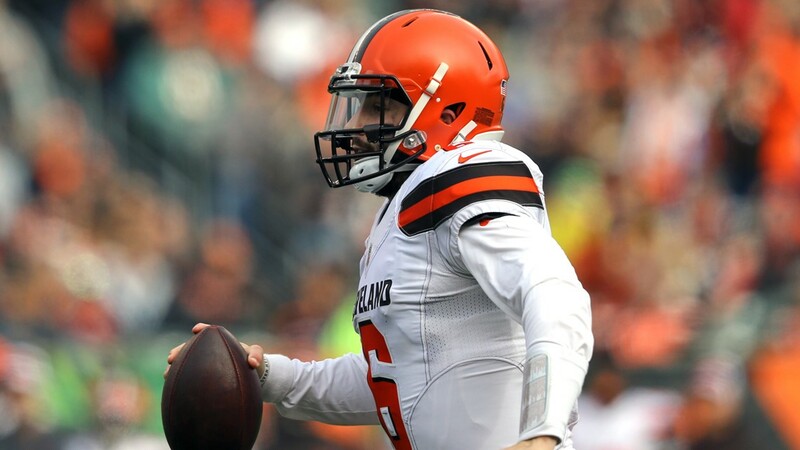 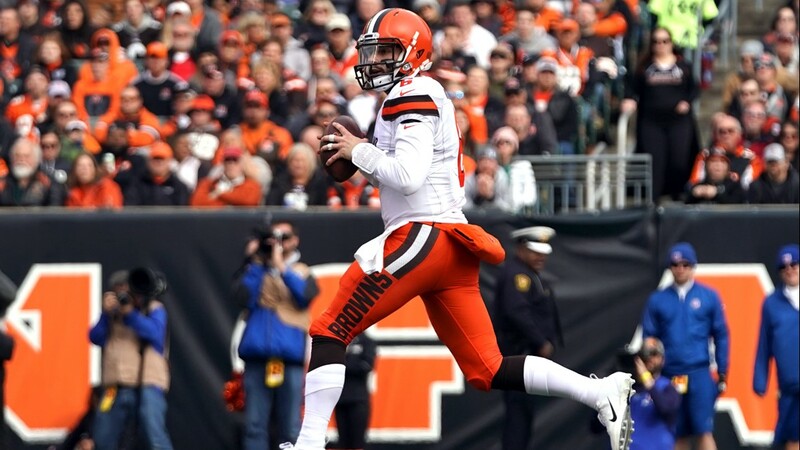 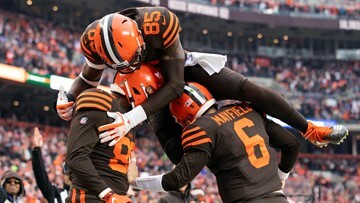 Rookie quarterback Baker Mayfield gave the Cleveland Browns a 35-7 lead over the Cincinnati Bengals with his fourth touchdown pass of the game at Paul Brown Stadium in Cincinnati.